Situation: suburbian area, hillside location, panoramic view. Center Bramberg in approx. 3 km. Neukirchen in approx. 6 km. Hollersbach in approx. 10 km. Next shopping possibility (Bramberg) in approx. 3 km. Train station Bramberg Wildkogel in approx. 3.3 km. Airport Salzburg in approx. 134 km. Ski run Panoramabahn in approx. 6.5 km (Resterhöhe/Paß Thurn/Kitzbühel). Smaragdbahn in approx. 4 km (Wildkogel/Neukirchen). Cross-country skiing trail in approx. 4.5 km. detached house, 14 people, 8 room/s, 7 bedroom/s, 4 bathroom/s, approx. 220 m², 3 floor/s. Please note: Owner uses 1 room within the apartment. Non-smoking house. Furnishing: rustic, with much wood, homely, wooden floor. 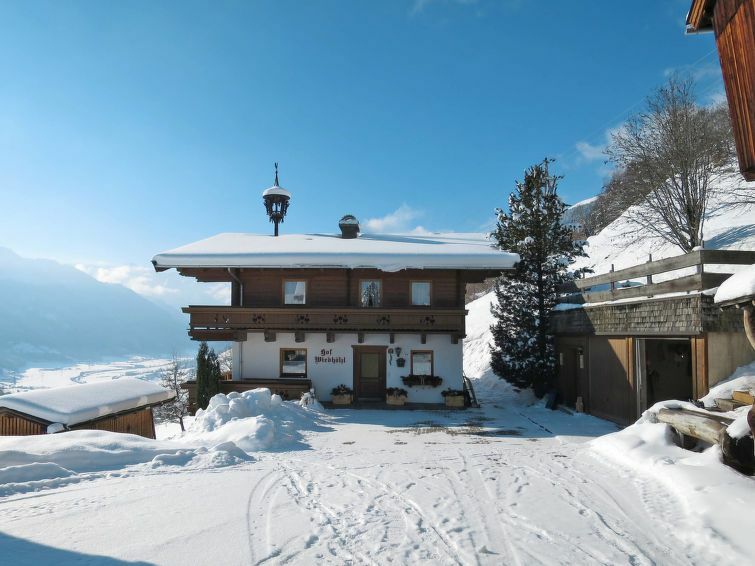 Equipment: satellite TV (2 TV(s)); internet access Wi-Fi (included); ski/ski-boot storage (heated). Living room(ground floor): corner bench, tiled stove, exit to balcony. Dining area: for 14 persons, in the kitchen. Kitchen: separate (ground floor). Kitchen/ cooking equipment: 4 ceramic hobs, oven, microwave oven, dish-washer, refrigerator, coffee machine. Kitchen 2: separate (floor 1), further dining area for 6 people, exit to balcony. Kitchen/ cooking equipment: 4 ceramic hobs, oven, refrigerator, coffee machine, water boiler. Bedroom 2(floor 1): double bed, exit to balcony. Additional information: wash basin in the bedroom. Bedroom 3(floor 1): double bed, exit to balcony. Additional information: wash basin in the bedroom. Bedroom 4(floor 1): double bed, exit to balcony. Bedroom 7(basement): double bed. Additional information: wash basin in the bedroom. Sanitary 1(ground floor): bath, shower. Sanitary 5(floor 1): bath, shower. Local service charges € 18 per person and week/short term stay (depending on occupancy) plus Holiday resort tax. Linen/towels Linen/towels available. Deposit € 300 (in cash). Pet not allowed.